RANCH STYLE HOME FEATURING 3 BEDROOMS AND ONE BATHROOM. 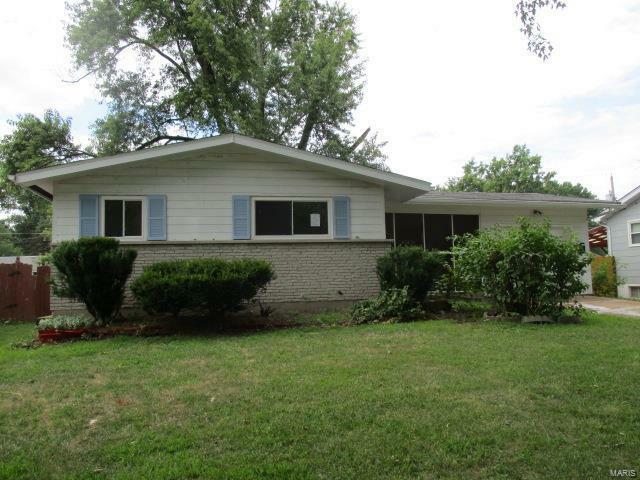 THIS HOME IS CONVIENIENTLY LOCATED CLOSE TO INTERSTATE 270 AND LINDBERGH. THERE IS A COVERED PORCH AND A REAR PATIO AREA. GOOD SIZED LIVING ROOM AND SEPARTE DINING AREA. THE KITCHEN HAS ENOUGH ROOM FOR A BREAKFAST TABLE. BEDROOMS ARE AMPLE SIZED. tHE BASEMENT IS PARTIALLY FINISHED FOR MORE LIVING SPACE. THIS IS A GREAT OPPORTUNITY TO OWN YOUR OWN HOME AT A GREAT PRICE! Please refer to HUDHomestore for the most recent bidding Period details and information on this property. HUD Acquired Property. Property being sold 'AS IS'. All utilities are turned OFF. Please, use discretion when showing and bring a flashlight. INTERSTATE 270 TO NORTH ON MCDONELL WHICH TURNS INTO HOWDERSHELL TO RIGHT ON LYNN HAVEN.